BOOKINGS FOR TOURS MUST BE PAID BY DIRECT DEBIT INTO THE ACCOUNT ON THE FORMS. REFERENCE TO BE USED ON BANK PAYMENT AND ACCOUNT BEING DEPOSITED INTO THE BANK ACCOUNT MUST BE FILLED IN. OPEN 20TH MARCH AND CLOSE MID-NIGHT ON THE 22ND APRIL TICKETS MUST BE COLLECTED AT THE INFORMATION CENTRE AT THE DROVERS CAMPFIRE PRIOR TO TOUR TIMES. Wednesday 24th April - 10.30am - 1.30pm Tour of the Boggabri Coal open cut mine, northeast of Boggabri. This is your chance to learn about Boggabri’s newest industry. Experience the workings of an open cut coal mine on this informative guided tour. Covered shoes must be worn, no smoking on site. No toilet facilities available during tour. Wednesday 24th April - 2.30pm - 4.30pm Take in the sights, sounds and smells of the cotton picking season in full swing. Local cotton farmer Andrew Watson takes you on a tour of his family’s farm just to the east of Boggabri to see the “fields of white” being picked ready for transport to the local cotton gin as well as other farming activities on the farm. A hat and water bottle are essential on this tour. A folding chair is also recommended. No toilet facilities available during the tour. Friday 26th April - 8.30am-2pm This field site tour of Santos’s Narrabri Gas Project will tour various sites in the Pilliga including a well site, rehabilitation site, and gas fire power station. Santos will provide required protective equipment, morning tea and lunch, bottled water, sunscreen and insect repellent. Covered shoes must be worn; NO SMOKING on site. Sunday, 28th April - 9am - 12.30pmA visit to “Skinny Lizard Longhorns”, located near Emerald Hill, will allow you to see this unique breed of cattle up close. Described as the “horniest” cattle, they are also one of the most colourful breeds of cattle and have a variety of different horn shapes. Geoff Dawson, owner of the Skinny Lizard Longhorn Herd, will give visitors a personal look at their herd and provide a commentary on the longhorn breed. You will be able to take as many photos of the longhorns as you wish and afterwards the Gunnedah Pottery Club will treat you to a delicious morning tea. Wednesday, 24th April - 9.30am - 1.30pm Tour of the best gardens Boggabri has to offer as well as the old Baan Baa school and gardens which have been lovingly restored to their former glory by current owners Geoff & Karen Nicholson. The tour includes a detailed recount of the history of the school up until it closed in 2005. The old school buildings contain an impressive collection of school memorabilia including an antique iron collection which Karen has been working on for more than 25 years. Friday 26th April - 9am - 11.30am An Informative tour of Boggabri's history including one of Boggabri’s newest main street business establishments, Vault Restaurant & Accommodation. Your host Christine will be proud to show you around the beautifully restored building she calls home and give you an insight into the enormous restoration project her and her husband have undertaken to bring this impressive building back to its former glory. The tour finishes with a sumptuous morning tea served in the restaurant. Wednesday 24th April - 9am - 4pm A tour of a working beef and winter cropping farm in the Boggabri District, owned by the Donaldson family since the 1880’s. 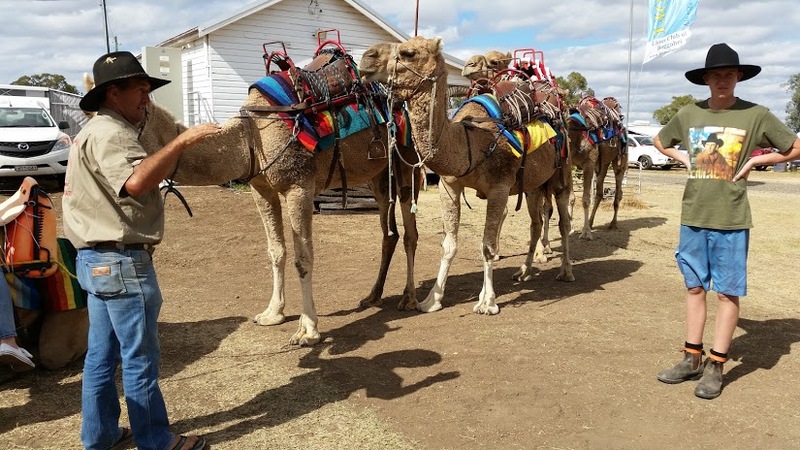 This tour includes some explanation of current agricultural production, observe and experience cattle handling and yarding, and also various historical anecdotes and background to the farm. It will also take participants through some hilly and picturesque farmland not accessed by bus tours. The tour involves some mild 4WD requirements. All vehicles participating MUST be clean and free of all mud and foreign plant material and will be subject to inspection prior to leaving Boggabri (to prevent the introduction of any foreign weeds or pests to the farm). The tour will include morning tea on the farm and lunch at the Willala Hall. Total distance travelled will be around 70-80 km. Other terms and conditions apply for insurance purposes. Friday 26th April - 8.30am - 3.30pm This tour takes us towards the nearby town of Narrabri, with a stop at Narrabri Fish Farm along the way. Owner Rick will take you on a guided tour of his operation including the hatchery, demonstrate fish feeding and may even find a few racing yabbies to put through their paces. Stocked species include silver perch, golden perch, murray cod and catfish. Morning tea will be at the fish farm. We then travel through Narrabri north to Mt Kaputar National Park and the Sawn Rocks area of the park. This easy walk (1.5km return) beside a shady creek bed leads us to a spectacular rock formation – the unique organ-pipe cliff face of Sawn Rocks. Our guide will provide insightful commentary on the history of this area along the way. We will finish off the tour with a bbq lunch in the nearby picnic grounds. Tour price includes entry to the fish farm, guided tours, morning tea and lunch. Thursday 25th April - 11am - 3pm Tour of the old Baan Baa school and gardens which have been lovingly restored to their former glory by current owners Geoff & Karen Nicholson. The tour includes a detailed recount of the history of the school up until it closed in 2005. The old school buildings contain an impressive collection of school memorabilia including an antique iron collection which Karen has been working on for more than 25 years. A “Mystery Farm” tour including an extensive vintage machinery collection is included on the Thursday and Friday tours along with a lovely light lunch at the school, prepared by Karen. Friday 26th April - 10.30am - 1.30pm Tour of the Boggabri Coal open cut mine, northeast of Boggabri. This is your chance to learn about Boggabri’s newest industry. Experience the workings of an open cut coal mine on this informative guided tour. Covered shoes must be worn, no smoking on site. No toilet facilities available during tour. Friday 26th April - 2.30pm - 4.30pm Take in the sights, sounds and smells of the cotton picking season in full swing. Local cotton farmer Andrew Watson takes you on a tour of his family’s farm just to the east of Boggabri to see the “fields of white” being picked ready for transport to the local cotton gin as well as other farming activities on the farm. A hat and water bottle are essential on this tour. A folding chair is also recommended. No toilet facilities available during the tour. Friday 26th April - 9.30am - 12.30pm Experience the workings of an open cut coal mine on this informative guided tour. Covered shoes must be worn; NO SMOKING on site. No toilet facilities available during tour. Saturday 27th April - 9.30am - 3pm This is the first time a guided tour of the Old Narrabri Gaol & Museum has been offered. Opening in September 1882 the Old Narrabri Gaol operated for 100 years, with over 30,000 entries in the family history section of the museum it is truly worth a visit. Tour price included entry to Museum, guided tour and lunch. Bookings for tours listed are on a “first in, first served” basis.